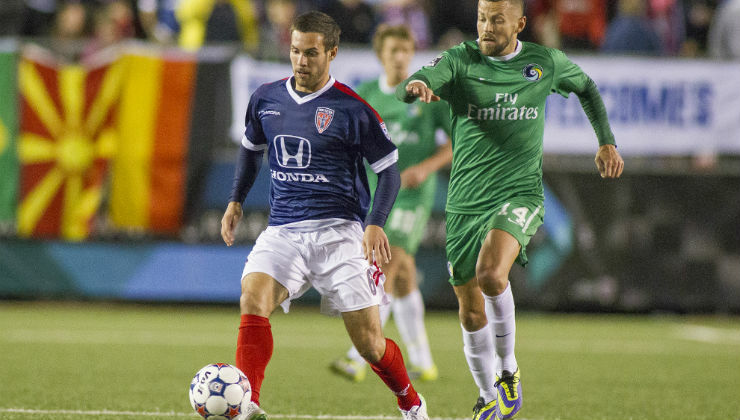 Less than 24 hours after installing a new head coach in Tim Hankinson, Indy Eleven continued to solidify plans for its 2016 season by announcing several roster transactions Thursday afternoon. Eight players have seen their contract options picked up by Indy Eleven for the team’s third season of North American Soccer League play next year: defenders Marco Franco, Greg Janicki, and Cory Miller; midfielders Dylan Mares, Don Smart, and Dragan Stojkov; and forwards Duke Lacroix and Wojciech Wojcik. “Indiana’s Team” declined to pick up options on eight other players: goalkeepers Jon Dawson and Kristian Nicht; defenders Judson McKinney and Erick Norales; and midfielders Marvin Ceballos, Daniel Cuevas, Kleberson, and Victor Pineda. “We're pleased to return at least eight quality players who have represented Indy Eleven well,” Indy Eleven President/General Manager Peter Wilt said. “‎I'd like to thank the players whose options we are not picking up and wish them the best for their future. It is a difficult process that requires decisions based on budget, increasing available international slots, and improving positional needs. In addition, loan arrangements with six players – defender Jaime Frias [C.D. Guadalajara (Chivas), Mexico]; midfielders Sergio Peña (Real Sociedad, Honduras), Dane Richards (New York Red Bulls, Major League Soccer), and Zach Steinberger (Houston Dynamo, Major League Soccer); and forwards Brian Brown (Montego Bay United, Jamaica) and Charlie Rugg (Los Angeles Galaxy, Major League Soccer) – have expired.